You became a big hit a few years ago when you made tutorials about different aspects of Filipinos, from language to eating to courtship. What made you decide to produce videos about being Pinoy? It happened unexpectedly and accidentally, actually. I decided in 2011 to upload a video every single day of various kinds: covers, vlogs, behind the scenes (I was a full-time musician in Canada at the time), and skits. One day I decided to create a comedy skit that imitated the way my parents spoke English and I called it the "Filipino Accent Tutorial." It became a hit and I followed up with more Filipino comedy skits. It eventually became the branding of my channel. What's the objective of your videos, and what would make you say that you've succeeded? My initial objective was to make a few people laugh, perhaps some close friends of mine that knew about Filipino culture or had Filipino parents. I didn't find the videos that funny, but when people seemed to really love it, leaving comments like "This makes me proud to be Filipino," I began to realize that the videos were impacting people in a greater and more important way. They were inspiring pride within Filipinos. As I created more and more Filipino-themed videos, OFWs would write about how these made them remember home and would help them deal with being homesick. The mission to create these Filipino celebratory videos became so strong that I eventually relocated to the Philippines where I could create videos that were genuinely Filipino. What made you shift from doing the Pinoy tutorials to Pinoy parodies? Some people may not know that in Canada I have been a singer and songwriter for many years, professionally since my stint on the nationwide singing competition Canadian Idol in 2003 (the first season). Comedy was really a skill that I sort of stumbled upon accidentally. As I was introduced to most as a comedian, I decided to incorporate my singing/songwriting passions gradually into my videos, so naturally the parodies were a great marriage between my comedy (a new passion) and my music (my lifelong passion). I have also released a lot of comic original compositions. In a super saturated platform like YouTube, it is easy to become stagnant as an artist, so I am always trying to bring something fresh and new to my work. I love venturing into new ways through which I can entertain people. Your musical parodies are hilarious, and generally have a positive vibe to them. Are you careful not to be satirical? Also, is there anything specific you want to say or show about the Philippines or the Filipinos with your videos? I'm careful, but I'm not going to be a watered down or lukewarm YouTube artist. Of course, I have a love for the country and the culture so I figure that as long as it is coming from a true and genuine place, my conscience will be clear when I release each video to the world. I realized as I began to tour different countries and meet the people who watch my videos that I had a big responsibility to positively uplift and raise awareness about Filipino culture and the Philippines. So a lot of my videos, though comic, are actually social commentaries. "I Have a Brown Body," my "Twerk It Like Miley" parody is one of my favorite social commentaries that sparked a very big conversation online about skin color. I am not afraid to be hated if I know my message is a good one. I don't need people waving Mikey flags. I want people talking about things that are important. Do you mind being explicit about the social commentaries you had in mind for your video "I Have A Brown Body," or sharing the gist of the conversation that happened online? The comments were pretty much positive! Mostly people, I'm assuming Pinoys, expressing their love for their skin. Yes, the song is essentially about how here in the Philippines there is an obsession with being light-skinned, and I take a fun jab at Philippine show business for perpetuating the beauty standard. Masses of people showed support for the topic and began talking about how wrong it is. People in the West are spending thousands of dollars to get tan skin when we Filipinos (most of us, anyway) have it naturally! Still, I used to feel pressure to stay light in order to get work. Anyone who's watched your videos can bet you're proud to be Pinoy. What makes you proud to be one? And what keeps you proud to be one amid bad news about the country? I am proud to be Pinoy for many reasons, but I suppose the general reason I am proud to be Pinoy is because we are good people. Sometimes I do talks at schools and students ask me "How can you be proud to be Pinoy when the government is corrupt and the country has a lot of problems?" I ask them to name a country that if they were born there they would be proud. Most will mention the US, so I go on to tell them of the many problems the US has, politically and socially, and they're shocked. Fact is every country has its problems, but the secret to feeling good about being in a country is to be part of the change. It feels better to be proud to be Pinoy if you are doing something to uplift the country and see its effects. I think that is why I am proud to be Pinoy. I feel like I'm part of this change and I see its effects every day. Are there difficulties in incorporating things you're good at (like singing, songwriting, being funny) when you're producing videos? No, none. I pinch myself every day. I love my work and it flows naturally at every step of the process. I've found my niche in this stage of my life and I feel as fulfilled as a spider building a new web every morning. 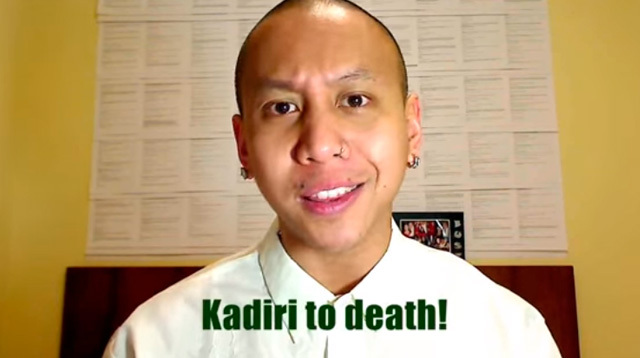 You're full Pinoy, born and raised in Canada. Is Canadian culture in some way a big part of you, too? What exactly in Canadian culture would that be? Canadian culture is a huge part of who I am. I think if I were born in the Philippines I wouldn't have done the Filipino videos because it would just be normal, every day life. But as an "outsider looking in," I had the unique perspective of spotting the subtle quirks of Pinoy culture that differed from that of the rest of the world. Even if I'm called "Pinoyboy," the irony of it all is that every day I am still discovering what it is to be Pinoy here in the Philippines. I cannot even speak Tagalog fluently. I am like a duckling that was raised with chickens, and then suddenly discovering what life is like living like a duck. I always tell myself "Oh, so that's why my parents are like that!" I feel like I am opening myself up and discovering my own clockwork. Also, everyone knows Canada produces good comedians and musicians, from Jim Carey to John Candy and Russel Peters, and Drake to Justin Bieber, Michael Buble and Celine Dion. Canada is like the Philippines in that way. Did you grow up with Pinoy culture being heavily integrated into your life? Or was it something you eventually got curious with? Yes, I was lucky enough to be brought up the Pinoy way. My mom cooked Filipino food every day, the family parties were all very Pinoy, and my mom called the toothpaste "Colgate" even if we were using some other brand. I know the new generation of kids in Canada, and more so in the US, are more disconnected from their Pinoy roots and are super curious to connect with and learn about that side of them. That's another reason why my work is important to me. I get messages and comments every day about how wives are teaching their non-Pinoy husbands, or Pinoy parents are teaching their full or half-Pinoy kids the Pinoy culture through my videos. Some people would say that the identity of being Filipino (or Chinese, etc.) actually lies in being able to speak the language. But considering intercultural marriages, or in your case being raised in another country, that belief can't accurately or fully apply (and let's face it, you're more proud to be Pinoy and seem to understand the culture more than other Filipinos). So how do you reconcile being proud to be Pinoy but still be in the process of discovering what it means to be one? Yeah, being Pinoy can have various definitions. I am Pinoy by DNA but I am also Pinoy in my mind. Hey, people can be Korean or American and still be Philippine citizens right? I don't think being Filipino means you necessarily need to speak a Filipino language. I speak English and French but it doesn't mean I am British or French. Isn't English also an official language in the Philippines?